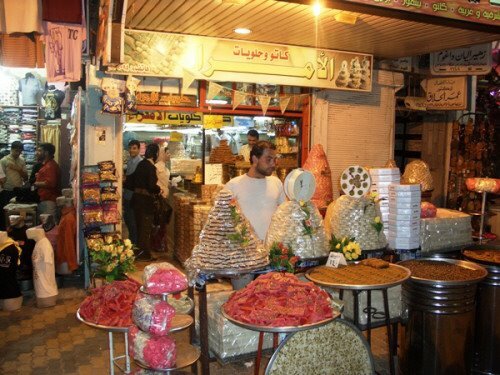 In Hama it is known as “Ma’amoul Abiad”, in other cities it has another name which is “Ghraibeh”. 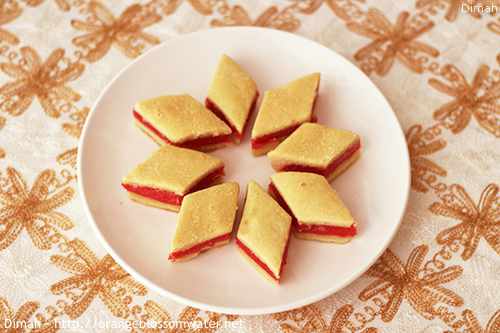 It is prepared from flour, sugar and ghee, and baked in the oven. Either purchased or prepared at home. 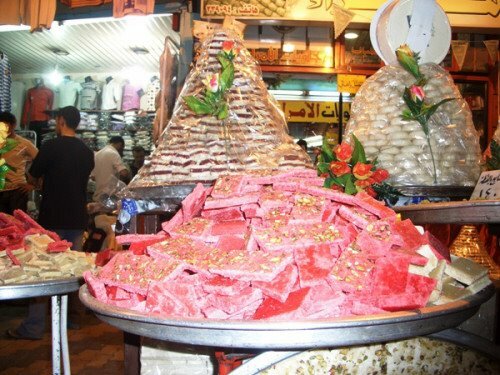 Makbouseh is a specialty of Hama (you can’t find it in other cities), and available only during Nisf Sha’aban, it has another name which is “Mehshiyeh”. 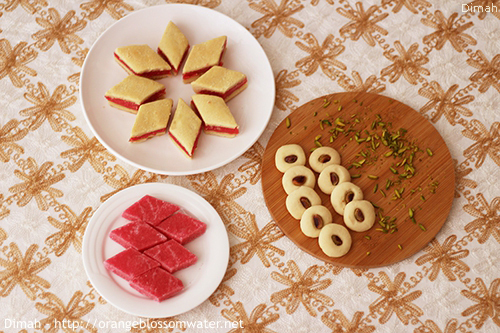 The dough is prepared from flour, sugar and ghee, and the filling is prepared from semolina, sugar, water, orange blossom water and food coloring, it is formed as two layers of dough and the filling between them, and cut into diamonds then baked in the oven. Either purchased or prepared at home. 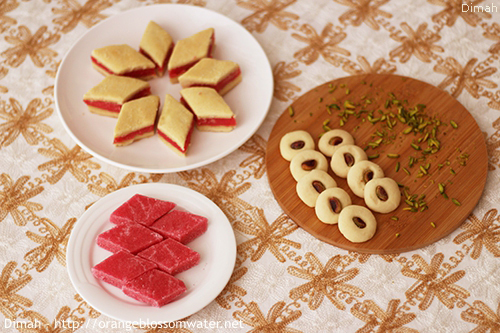 Mahia is a specialty of Hama (you can’t find it in other cities), and available only during Nisf Sha’aban. 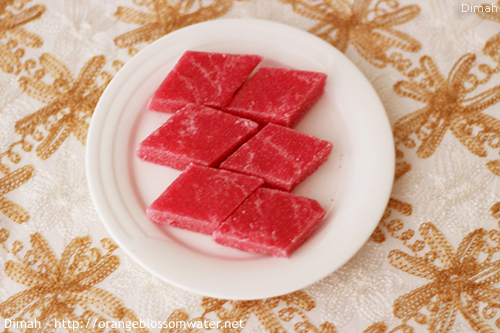 It is prepared from semolina, sugar, ghee and rose water, cooked and cooled then cut into diamonds, it is available in two colors white (without food coloring) and red (food coloring is added). 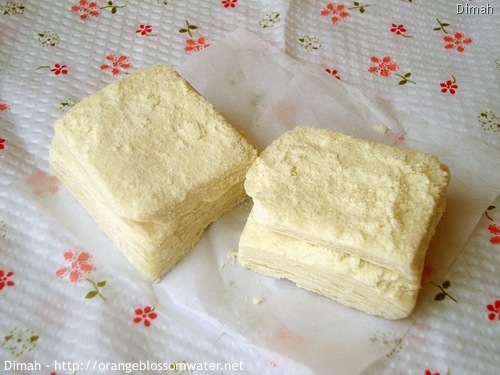 Usually it is purchased and no one make it at home, but I asked for the recipe and it actually took few attempts until I got a result almost similar to Mahia sold in Hama. 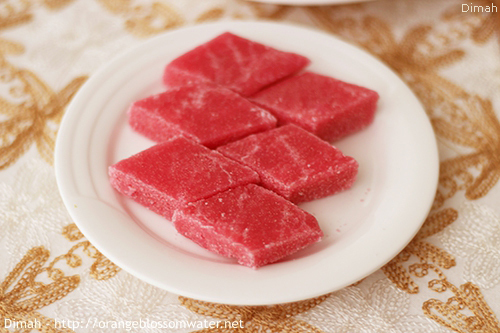 Bashmina is a specialty of Homs, it is available in Homs all over the year. 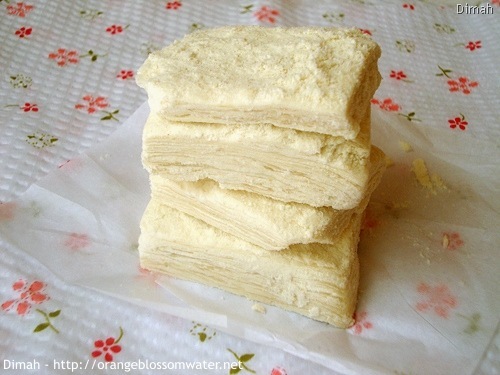 It is prepared from flour, sugar syrup and cornflour (cornstarch), formed into square sheets and these thin sheets are arranged over each other as several layers, they are very light in weight, then cut them into cubes, and dusted with powdered sugar . It is purchased and can’t be prepared at home. These photos of Bashmina are from 2010. 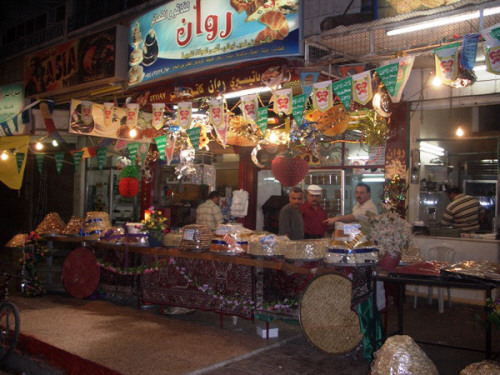 Here are photos from Hama that show you the celebration of Nisf Sha’aban, click here and here and here. This entry was posted on Monday, May 23rd, 2016 at 9:31 PM	and is filed under Celebrations and Occasions. You can follow any responses to this entry through the RSS 2.0 feed. You can skip to the end and leave a response. Pinging is currently not allowed. 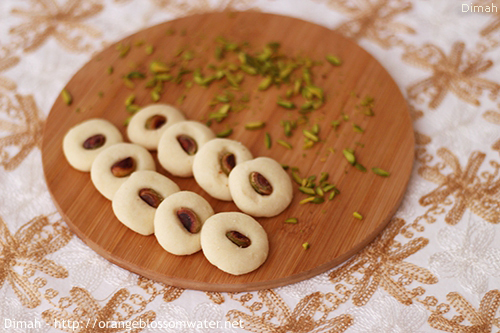 Sawm maqbool va mobarak ! 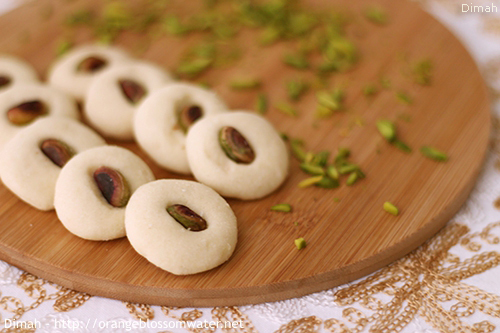 Famidha: no, mahia is not stuffed in makbouseh. 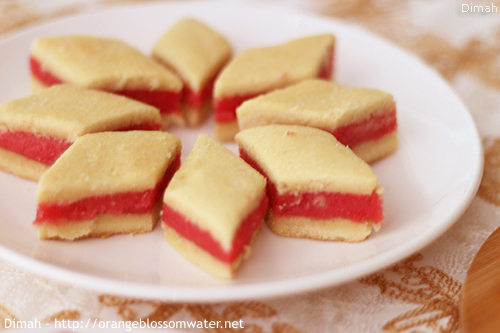 I haven’t tried making bashmina. Everything displayed here is totally new to many people in Syria, too. 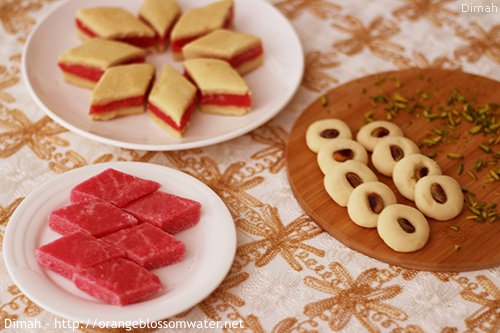 These sweets are specialty of my city “Hama”, and people from other cities like “Damascus, Lattakia, Aleppo” don’t know these sweets. 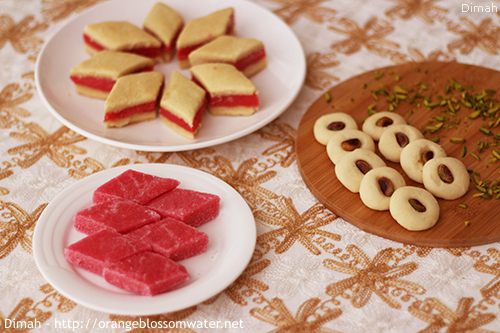 Two days ago, a friend of us from Damascus was really surprised when he tasted makbouseh and mahia, he has never known about these sweets.